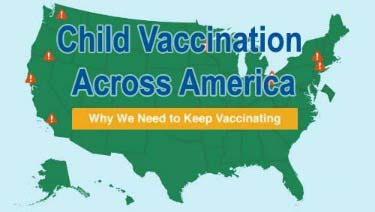 Healthy Children > Safety & Prevention > Immunizations > Vaccine Protection: How Healthy is Your Community? From the moment we become parents, we work to keep our children's environment safe. We child-proof our homes and make sure poisons and dangerous objects are secured wherever our kids spend time. But we aren't always as diligent about making sure the community spaces where our children learn and play are protected from threats we can't see, like infectious diseases. Just this fall there was a vaccine-preventable disease reported in my son's 2nd grade class. When he started kindergarten a couple years ago we were told the class was 100% up-to-date on immunizations, so I got done worrying about things like exposures to chicken pox, measles, and mumps from his classmates. We know vaccines aren't 100% protective, of course, but I took stock in knowing that his class of children was protected as best they could be. So, when I heard about the case of chicken pox, it reminded me I needed to check back in. Because he's fully immunized, I wasn't worried when I heard the news about this case of chicken pox (varicella vaccine has a high vaccine effectiveness, with 98% of children protected after two doses). But it got me thinking that I needed to contact the school and see how we're doing. Not just on the state-mandated vaccines, where we scored 100% a couple years ago, but on the flu shot, too. Often we (as parents) have no idea the percentage of a class that is protected on this essential, every-year vaccine. Every parent should know if their child resides, learns, and plays in a safe environment. Knowing their child's "world" is up-to-date on vaccines is an important data point, and knowing where your community stands just got a little easier! The new AAP interactive infographic is a great, high-level view into knowing how your state fairs with status on vaccines and protections from outbreaks of infections like measles and pertussis, as well as influenza. Knowing how your community is doing on vaccines and speaking up about what you believe matters. More than ever before, clearly articulating that you vaccinate your child and that you want your child to be surrounded by people that do the same is essential. Check out your state's data in the AAP infographic. Get even deeper into the data with online resources like School Digger that allows you to look at vaccine data at the school level. Pediatricians and parents can partner unlike ever before and with tools unlike we've ever had to make sure the spaces where our children spend their days are as safe as possible. Speak up, ask about rates at your schools, and tell other parents how much you value vaccines that protect your children and their friends. Wendy Sue Swanson, MD, MBE, FAAP, is a practicing pediatrician and Chief of Digital Innovation at Seattle Children's Hospital. She serves on the executive committee of the American Academy of Pediatrics Council on Communications and the Media and is the author of Mama Doc Medicine. In her blog, Seattle Mama Doc, she works to revolutionize health care delivery using social media and digital tools to bridge the gap between parents and doctors. Dr. Swanson lives in Seattle, WA with her husband and two boys. Follow her on Twitter @SeattleMamaDoc.